De Cruz, H., Neth, H., & Schlimm, D.
De Cruz, H., Neth, H., & Schlimm, D. (2010). 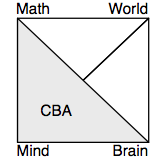 The cognitive basis of arithmetic. In B. Löwe & T. Müller (Eds. ), PhiMSAMP. Philosophy of mathematics: Sociological aspects and mathematical practice (pp. 59–106). London, UK: College Publications. Overview: Arithmetic is the theory of the natural numbers and one of the oldest areas of mathematics. Since almost all other mathematical theories make use of numbers in some way or other, arithmetic is also one of the most fundamental theories of mathematics. But numbers are not just abstract entities that are subject to mathematical ruminations — they are represented, used, embodied, and manipulated in order to achieve many different goals, e.g., to count or denote the size of a collection of objects, to trade goods, to balance bank accounts, or to play the lottery. Consequently, numbers are both abstract and intimately connected to language and to our interactions with the world. In the present paper we provide an overview of research that has addressed the question of how animals and humans learn, represent, and process numbers. Keywords: Mental arithmetic, numeral systems, number representations, algorithms, mathematical practice, cognition, notation, CBA.